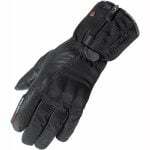 Ideal for winter riding: The best winter gloves use Gore-Tex and the Richa Sonar gloves are no exception. Breathable, waterproof and windproof means that you are prepared for whatever the British weather throws at you. As for the lining, tri-fleece has been used which is super soft and will keep your fingers feeling toasty! Protection against the road: These gloves feature a PVC CE knuckle protector and have leather reinforcements on the palm. To ensure that you stay visible on the road Retro Reflex technology has been used on the back. These stylish winter gloves have everything you need and at a great price too! "Water proof and warmer than their light weight construction would suggest. May need inner gloves for very cold weather."